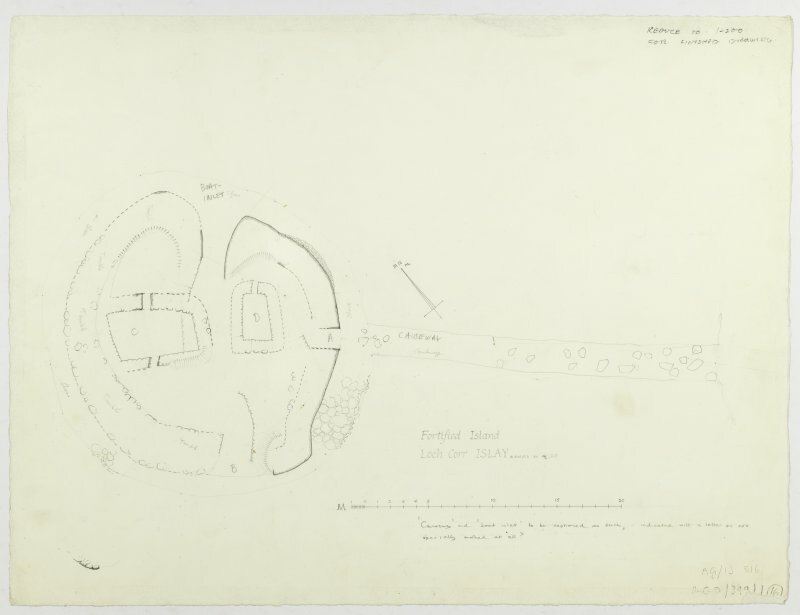 General oblique aerial view of the island dwelling on Loch Corr, taken from the SE. NR 227 697. 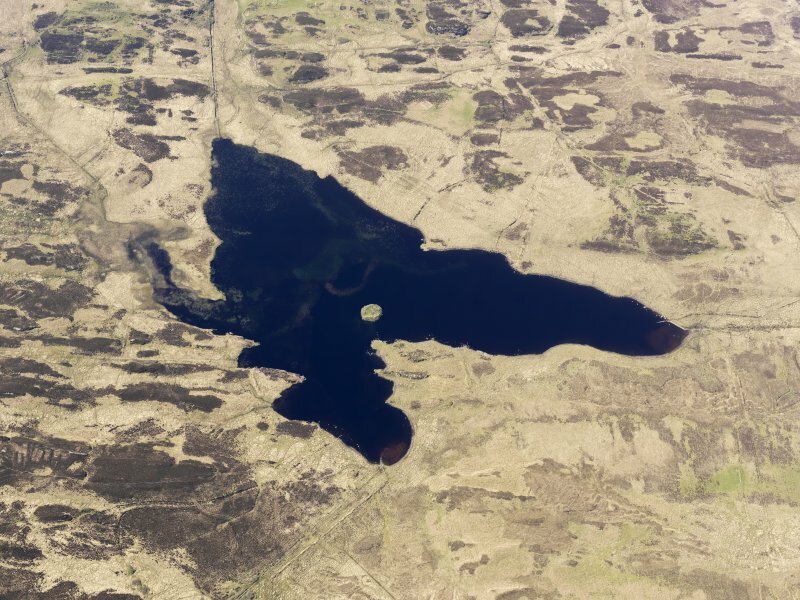 There are traces of a building on an island in Loch Corr and also possible traces of a stone causeway. 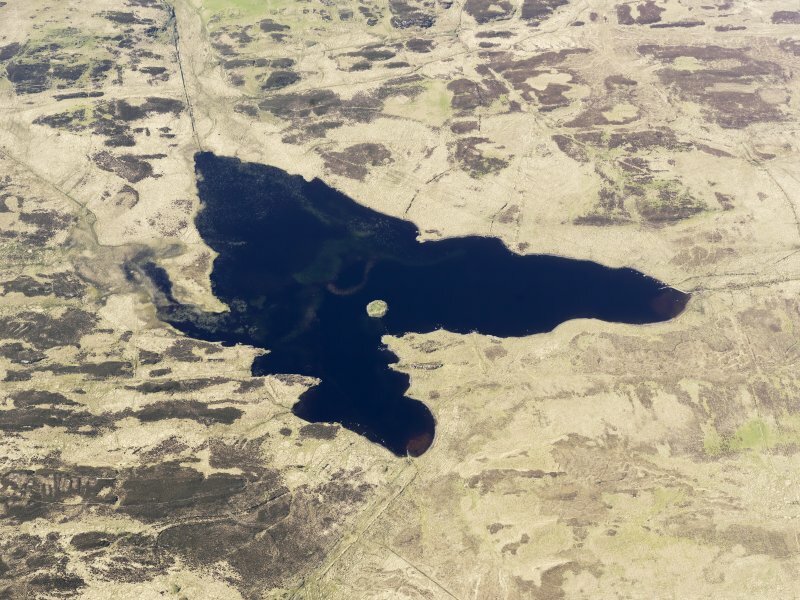 This island, which is situated in a small loch in barren moorland, is probably of artificial origin. It was formerly linked to the E shore by a causeway about 25m long and 2m wide, now represented by scattered boulders. The island is roughly circular, having a diameter of about 25m, and it is enclosed by a drystone wall, varying in thickness from 2m to 3m which in the E sector is preserved to a height of 2.2m. In the NE sector the wall curves inwards to form an entrance-passage, probably associated with a former boat-inlet, and there were other entrances in line with the causeway and in the SW sector. Within the perimeter wall there are the remains of two round-angled buildings whose drystone walls survive to a height of about 1.1m. The larger of these measures 6.5m from NW to SE by about 3.5m transversely within walls having a maximum thickness of 1.3m, and has opposed entrances in the side-walls. The smaller building, which measures 3.6m from NNE to SSW by about 2m transversely, has a single entrance in the NNE end-wall. No documentary references to the island have been identified, but the character of the defensive wall suggests that it belongs to the late medieval period. NR 2261 6957 Located 28m W of a spur which juts out from the E side of Loch Corr. The site is accessed by a causeway of large boulders, 25m long and 4.5m wide, which is 0.2m below the water line. The islet is a nearly circular, stone-covered mound which measures 32 x 34m at its base. Below the water line the islet is composed of well-rounded, medium-sized stones. The upper surface of the islet sharply contrasts this, and is composed of large angular blocks of stone. 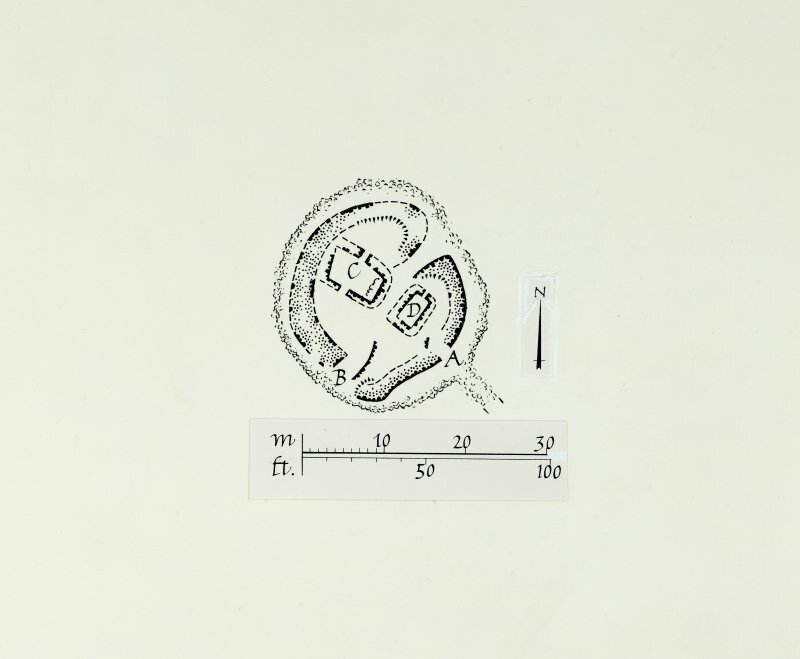 The upper platform of the site, located 2.1m above the surrounding loch bed, is also roughly circular, measuring 23.5 x 19m, and was covered with a dense growth of briars at the time of survey. A perimeter wall, up to 2m thick, encircles the upper platform just above the water line. Although heavily overgrown, this walling still survives to a height of 2m in the SE and NE quadrants of the site. A boat noost is located in the NE sector of the islet facing deeper open water. The noost is a triangular depression in the islet's surface, which measures 5m across at its entrance and extends 8m into the site from the water line. This depression continues below the water line to the bottom edge of the site. The interior of the site is occupied by the foundations of two sub-rectangular buildings which measure 3.8 x 4.7m and 6.4 x 9.7m externally. Most of the foundations still stand to 1m in height and appeared to be 0.7m and 1.1m in thickness, for the smaller and larger buildings respectively. The smaller of the two buildings is free-standing near the centre of the islet, oriented with its long axis NE-SW. The larger building incorporates the perimeter wall into one side and is oriented with its long axis NW-SE.